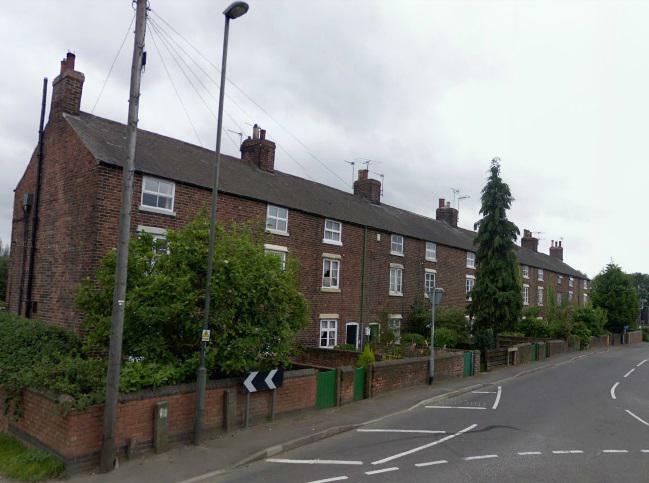 William Frost married Rachel Bircumshaw in 1861 and ten years later we find them living in New Stanton, an area at the bottom of Quarry Hill between Little Hallam (to the North), Kirk Hallam (to the West), and Stanton by Dale (to the East); it lies within the parish of Stanton by Dale. They have been blessed with the birth of four children, so in addition to the two daughters William had with Sarah Ann, and Rachel’s own daughter (Mary), they’ve already grown into quite a decent sized family group. The handwriting of the enumerator who recorded the above information isn’t the easiest to read, but William is aged 37, and employed as a labourer (…at the nearby ‘The Stanton Iron Works’ which later became to worldwide reknown company ‘Stanton & Staveley’), Rachel is now aged 34, then we have Mary Ann, Harriet , Mary Bircumshaw, Eliza, Isaac, Joseph, and Sarah Jane, with all of the children being scholars. Further research as to the house in which the Frost family were living in at this time has been carried out, and by checking the enumerator’s round, I believe I have narrowed their house to being one of two, and I’ve deduced this by using the ‘No of Schedule’ (an example of this numbering can be seen on the above census image). Looking on the aforementioned census, we see that the Frost’s are given the schedule number of 109, with schedule numbers 101 to 117 belonging to the row of houses they lived in. Looking on maps to ascertain the whereabouts of these houses, it was rather pleasing for me to discover that in the area called ‘New Stanton’ there was just one row of houses, yet there were just twelve houses, so how could there be seventeen schedule numbers used when there were only twelve house, for 12 divided by 17 doesn’t work, until one looks closer! The answer to this question lies within five of the houses and the way in which the enumerator listed people. 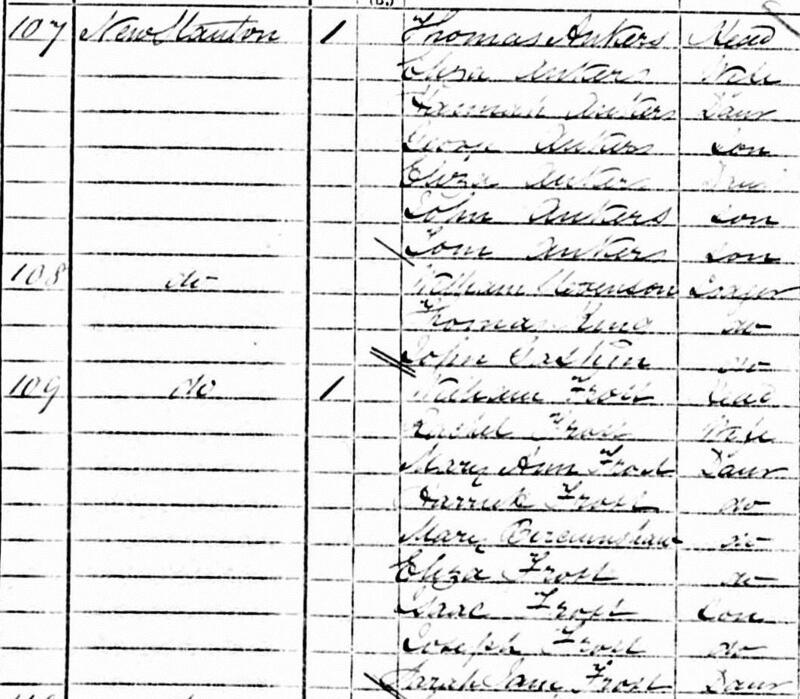 As can be seen on the example shown here, the enumerator has given 3 schedule numbers (107 to 109) to what looks appears to be three families, but I was wrong to accept this in the way I’ve written it above, for if one looks closer at the entry for schedule number 108, one can see that they are in fact lodgers in the household of the Ankers family (listed as 107) above them. This happens five times in the twelve houses, and that’s why, in this instance, 12 has been divided by 17. 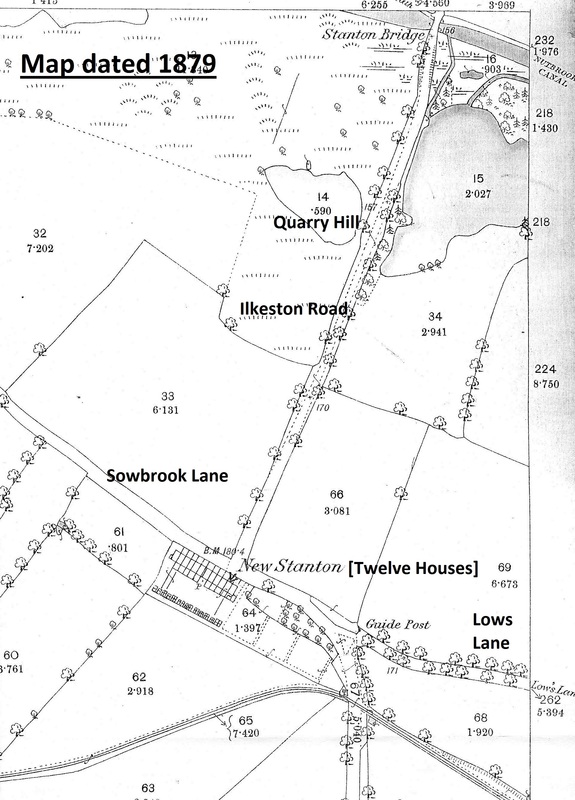 It is not been possible to be 100% sure as to which end of the row the enumerator recorded the census, but he arrived in New Stanton having come down Quarry Hill, and these houses lie at the bottom of said hill, so I presume he gave the first house he came to the schedule number of 101. It’s been good for me as a researcher to be able to understand what the enumerator did, and by gaining that understanding, to be able to place the Frost family to a specific house – or at least to one house out of two. 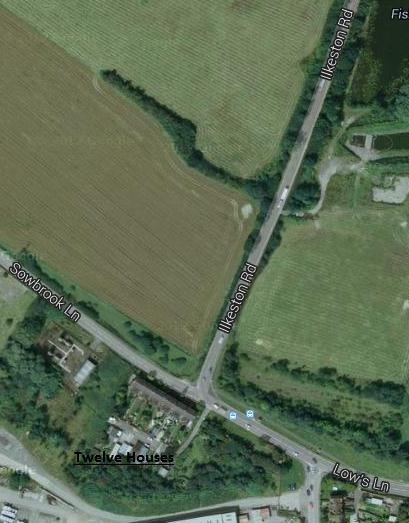 The row of houses referred to as New Stanton on the previous page actually lie on ‘Sowbrook Lane’; which in turn lies directly at the junction with Ilkeston Road/Quarry Hill and Lows Lane. I attach a table of occupants and images of the said houses. Occupants are listed by surname and in ascending Schedule Number order. A general view of Sowbrook Lane as seen from the bottom of Quarry Hill (looking west). 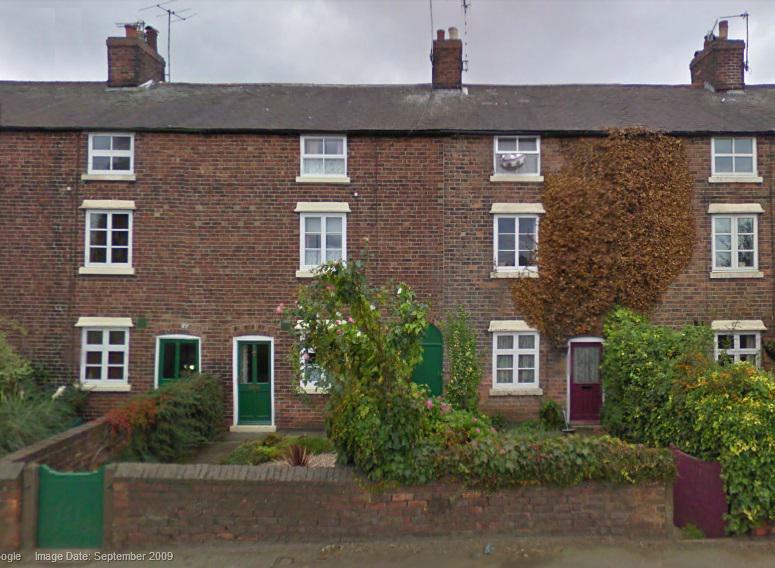 I believe the house occupied by the Frost in 1871 was second from the left. And what of William and Rachel after 1881?